Before Liberty University freshman Justin Holdstock packed his belongings, before he met his new roommates, before he rode his bike to his new dorm on East Campus, he was a normal college student living on the Hill, one of Liberty’s oldest housing facilities. On Monday, Oct. 15, at 1 p.m., Holdstock received an email from his resident director, requesting an important hall meeting. As his eyes scanned the notification, the cold realization of leaving his beloved dorm became a reality. 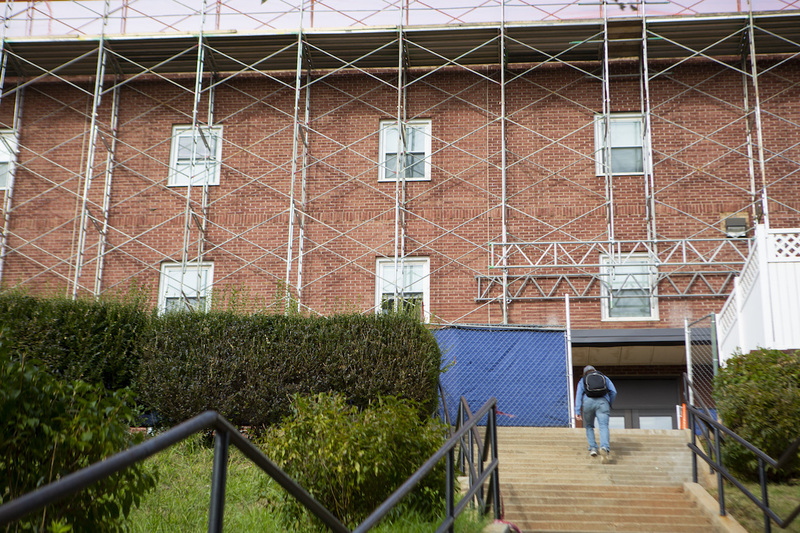 Heavy construction and renovation have aggravated Hill residents all semester, particularly students living on the top floors. However, this complication did not deter students from building friendships and making the most of their college experience. In July, incoming students who would live on the Hill received email notifications warning of construction, but many students remained in their chosen housing. Unlike several other dorms dotting Liberty’s landscape, the Hill facilities do not contain common rooms. Instead, Hill residents use each other’s dorm rooms as “hang-out” areas. This is where Holdstock made his first friends in college. Construction clogged space between buildings, preventing students from utilizing both dorm entries. This inconvenience, according to Holdstock, hindered the relationship between dorms because the construction equipment created physical barriers between buildings. But construction was not originally supposed to reach this magnitude. What started as simple renovation soon escalated to something unforeseen. According to Senior Vice President of Student Affairs Dr. Mark Hine, aesthetics along with aging roofs played an important role in the original construction decision, which would include new roofing, renovated bathrooms and common areas. The seven buildings atop the Hill were erected in the 1980s, years before the Jerry Falwell Library, the School of Music or DeMoss Hall entered the scene. Once the Divinity Tower — Liberty’s tallest building— came to fruition, the structural disunity between the Hill and other campus sites became apparent. According to Hine, the Hill’s mismatched appearance prompted the need for new roofing, along with an additional floor and renovated bathrooms. But everything changed when Dorm 22 exposed complications. “When they started peeling back, they found out something they did not know,” Hine said. Rebar — reinforcement bars that strengthen concrete — did not reach the top of the building of Dorm 22, which demanded important attention. Water damage and discoloration, which could possibly be mold, also caused minor concerns. These realizations prompted administrators to act. The situation accelerated when Hurricane Michael unleashed intense rainfall on Lynchburg, causing even more impairment on the Hill dorms. During the hall meeting Monday, Oct. 15, it was announced that the top floors of 22 and 23 must evacuate and disperse to different locations around campus. This required separating friends, RAs and entire halls. “There were definitely people who were frustrated, which is understandable,” DuBose said. Several days later, plans changed when administrators realized only Dorm 22 posed serious living inconveniences in the form of leaks and water damage. A bathroom ceiling tile in another dorm fell, but administrators said that did not justify evacuating an entire floor. Sophomore Joel Hartzler, who moved three times throughout the commotion, expressed sincere gratitude when he heard he could return to Dorm 23, his original Liberty home. Not only were friends reunited, but administrators announced that construction on Dorms 20, 21 and 23 would be postponed until summer. Since Dorm 22 revealed the most complications, students from its highest floor cannot return until construction finishes next semester. According to DuBose, more than 40 students moved from 22-3 to different places around campus, and several moved off campus. 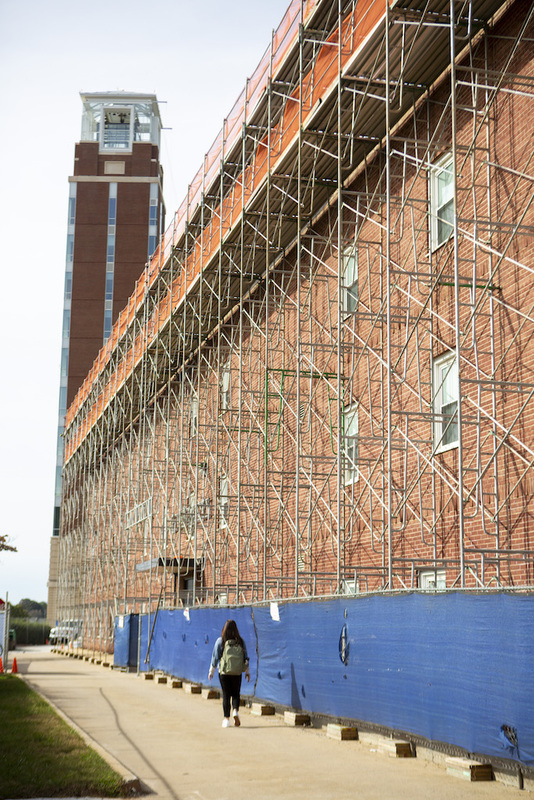 After construction, the students from Dorm 22 will have the option to return to the Hill or live elsewhere. It was a trying time for many students, including Hartzler, who described the process as a once in a lifetime experience. The RAs on 22-3 moved next door to 23-3, where they will serve however necessary. Hartzler said the community on the Hill is unlike any other dorm community at Liberty. He said the entire construction situation brought him closer to his friends. Our son is on 23-3 and let’s just say….that is a floor of brothers!!! I loved living in 23-2 and-3 when I attended…way back in the mid80s. We had some of the best RAs and leaders on those floors. Krystel always stands out in my mind as one of the most gentle and nice people I ever met. And I am grateful for all the effort her and her team put into us on those floors. So glad they are renovating and not replacing these buildings. And who cares if they don’t match. They are part of the history of the school. Thank you Liberty for always being what God wants you to be! His!